“It’s not a gimme,” Idaho boating legend Rob Lesser told Paddling Life earlier this month, as high flows on the Snake River near Twin Falls, Idaho, have drawn plenty of attention to the raging 212-foot Shoshone Falls — delighting thousands who have been flocking to see it for weeks now. 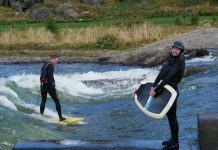 But more importantly, it’s offering a serious spike in adrenaline to local and international Class V kayakers who are also flocking to the legendary waterway. 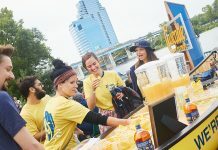 Lesser recommends using extreme caution in running the falls. Expert whitewater kayakers and rafters are seizing the opportunity to test their mettle on some of the nation’s biggest whitewater rapids on the Mid-Snake region in southern Idaho in April and May, and maybe into June, when there is sufficient river flow creating a rare opportunity to experience these elusive rapids. Because of the deep snowpack levels clocking in at 130 percent of normal in the Gem State, the Bureau of Reclamation has been releasing flood-control flows down the Mid-Snake below Milner Dam in recent weeks. Reclamation officials said the releases below Milner are peaking last week at 15,800 cfs, and flows will slowly subside over the next six to eight weeks depending on weather and irrigation demand. Lesser, an old-school legend and Idaho local who has run rivers all over the world, says the Miracle Mile has the biggest whitewater in Idaho, and, “is certainly one of the biggest whitewater sections in the United States, definitely in the top two or three because of the volume of water that runs through there.” He describes it as a Grand Canyon-like experience. 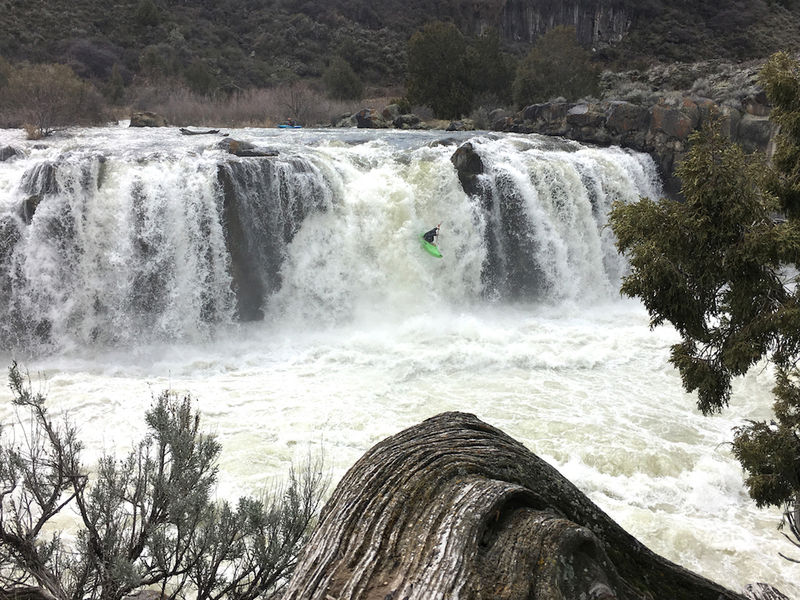 For boaters like Lesser, the fun starts with the Class V Milner Mile, below Milner Dam, continues with a 25-foot drop off the left side of Caldron Linn or Star Falls — another expert-only run — and then some gnarly boaters top it off by running the Class IV Murtaugh section of the Snake: a 14-mile run with nearly non-stop action composed of 10 Class IV rapids. 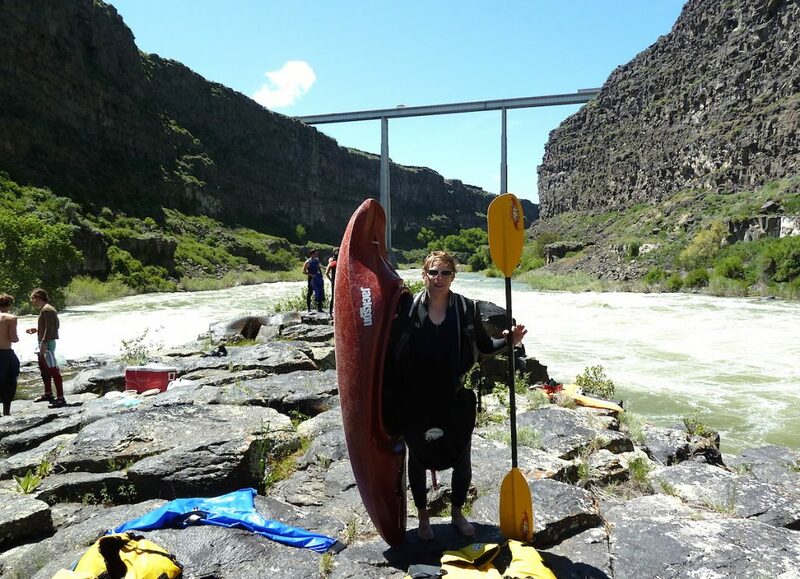 Class V kayakers are expected to flock to the Mid-Snake area in the coming weeks from Utah, Jackson Hole, Ketchum-Sun Valley and California. 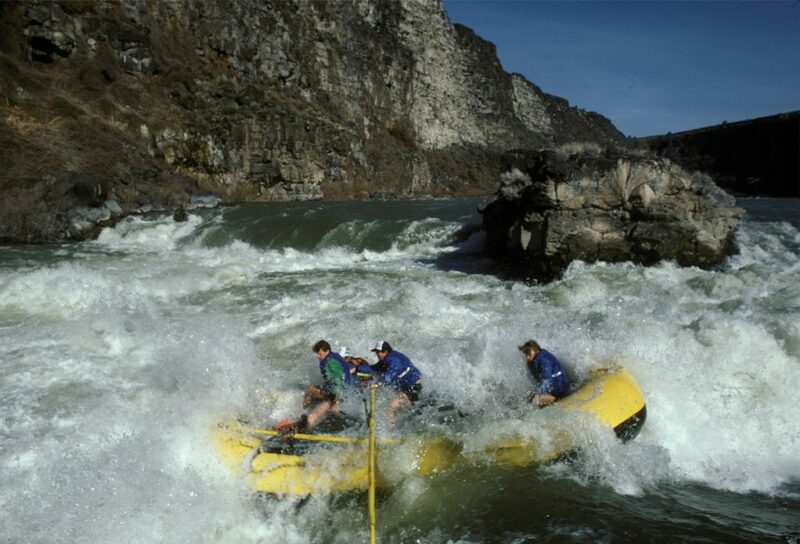 Idaho is known as the whitewater capital of the United States with more miles of whitewater than any other state in the lower 48. 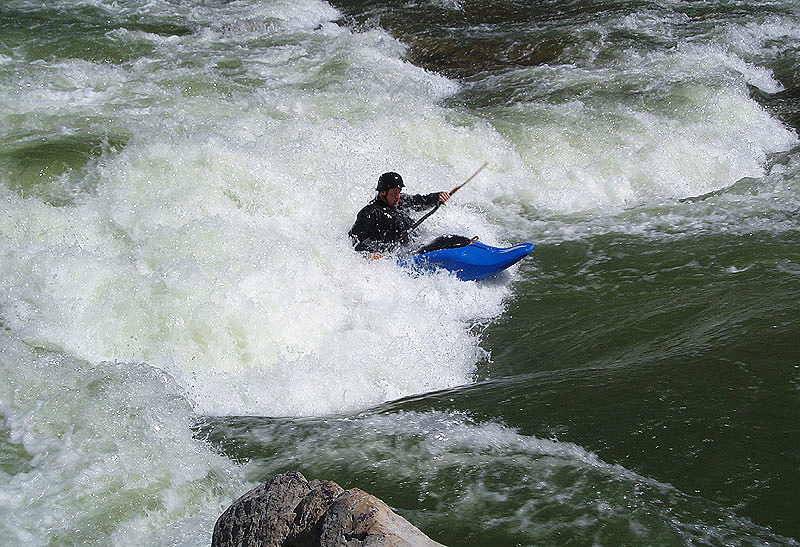 The North Fork Championships, held each June on the gnarliest section of the Class V North Fork of the Payette River, has put Idaho on the map by inviting the best expert kayakers in the nation to compete for prizes and bragging rights while running super-challenging slalom gates on the North Fork in Jacob’s Ladder Rapids. After running the Miracle Mile, Kneidl and his buddies launched off the left side of Caldron Linn, or Star Falls. Caldron Linn was downgraded from Class VI to Class V+ after kayakers started running it. Running the right side of Star Falls “looks like certain death,” he says. A rocky shelf on the left side is doable for expert kayakers who are versed in running waterfalls. “It’s a pretty clean waterfall overall,” Kneidl says. The Murtaugh section also is doable for rafters and catarafts. Idaho Guide Service offers guided trips on the Murtaugh for $125 a day. Trips will begin on weekends in May. In the Murtaugh reach, the waves are, in a word, huge, with remnants of historic mining activity lining the shores and birds of prey circling in the Murtaugh canyon. Expert boaters and Idaho Guide Service recommend that anyone boating in the Mid-Snake wear a high-quality life jacket, a wet suit or a dry suit for protection from cold water, and a helmet. Be sure to go with people who know their way through the rapids.